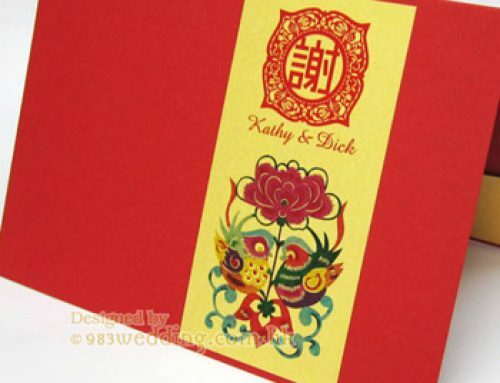 Two blooming flowers dancing on the invitation, which symbolizes the couples falling in love and deciding to get married. 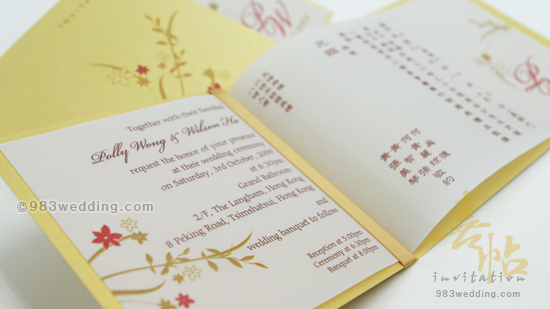 This wedding invitation features blooming flowers. 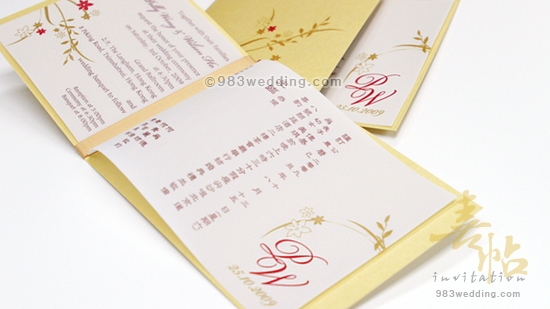 In fact, the design of this card can be considered really modern Chinese wedding invitation. The color is Chinese while all the other design elements are not. 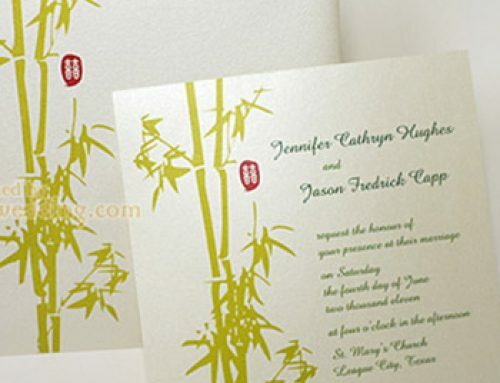 This design would fit brides and grooms who want a Chinese design which does not look too Chinese or Asian. 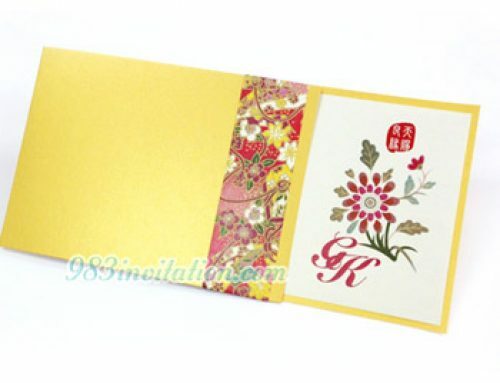 The cover of the card is yellowish gold. This is why we say that the color of it is very Chinese. The floral pattern on it mainly consists of two colors. The leaves and branches are in dark yellow color. And there are two red color flowers on it. These two colors can also be considered something Chinese. 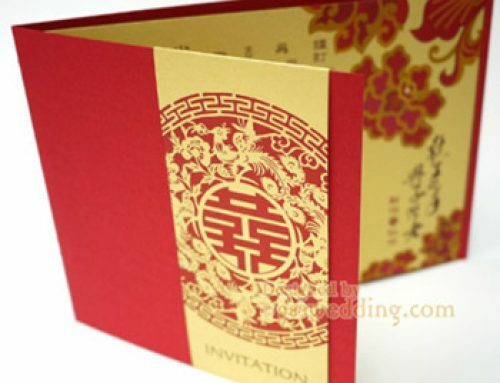 We choose to use especially red for the two pieces flowers on the card cover because it will deliver a Chinese sense. On the other hand, the colors of the branches and the two flowers are so different that there will be a big contrast between them. This will help to ensure that these two pieces of flowers will become the focus of the cover design. Yet, the pattern is not something traditional in Chinese culture. In fact, these floral patterns will look like some modern designs. The combination of modern patterns with Chinese colors makes this design unique. 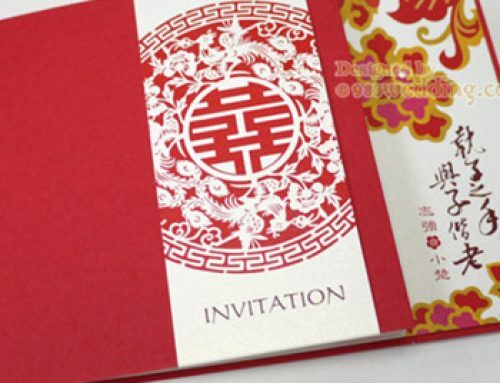 Apart from all these patterns, the word “invitation” is also subtly printed on the card. The color of it is the same as the branches. The font we choose is a simple sans-serif font. This choice help to make the word even more subtle. The insert is made from tracing paper. The floral patterns and flowers are printed on it again in order to echoes with the cover design. The colors of the patterns also echo with the colors printed on the cover. Besides, a simple monogram will be created for the couple. It will be printed on the right-hand side of the insert so that it can be seen before opening the card. 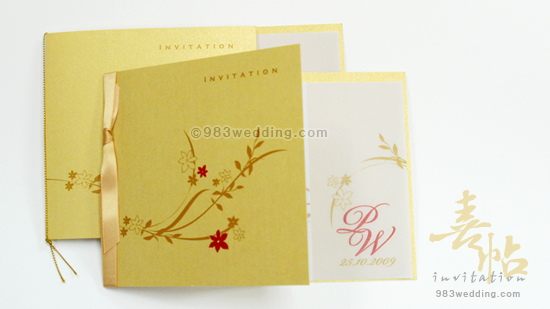 The insert is held by using a piece of yellowish gold ribbon. This will give the design a modern look. Couples who want something really romantic will opt for this option. 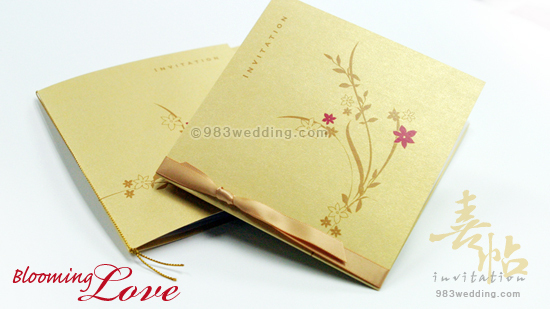 250gsm gold color pearlized paper and insert with full-color printing on ONE side. Tie by ribbon or gold color string.